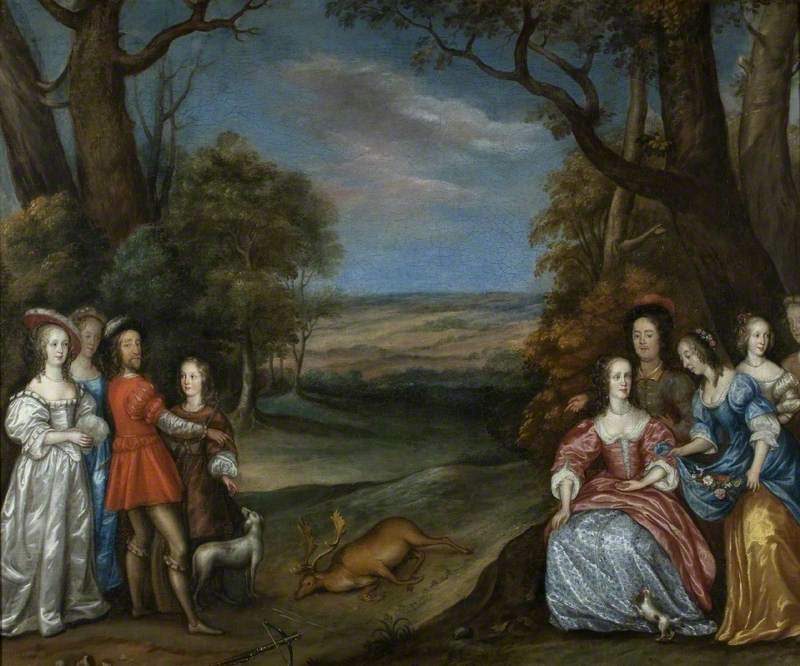 Not much is known about the life of Joan Palmer, who was the daughter of William Palmer, an official of the royal parks of St. James's and Spring Gardens (under James I), and his wife, a woman named Mary. Joan was likely born about the year 1606, and in 1626 she married the poet and playwright Lodowick Carlile (sometimes "Carlell") who was, like her father, an official in the Royal Parks system, in his case keeper of the Great Forest in Richmond Park. He was also a courtier: gentleman of the bows for Charles I and a groom to the king and queen's privy chamber. While she had no formal training--or, at least, we do not know how she acquired the rudiments of painting technique--Carlile soon distinguished herself as an amateur painter. Her work came somehow to the attention of King Charles I, and she seems to have begun her professional life as an artist by copying original Italian paintings and reproducing them as miniatures. She and her "mentor," Sir Anthony Van Dyck, who must have provided her with some kind of encouragement, if not instruction, are known to have received an impressive gift from the king of ultramarine paint, said to be valued at £500. In her recent essay on the artist, Jane Eade quotes from contemporary letters that suggest Joan Carlile was in need of money and attempting to earn a living through her painting: she "means to make use of her skill to some more advantage than hitherto she hath done," observes one friend of the Carliles, who also notes, in a subsequent letter that Carlile is hoping "to raise up some fortune for herself and children." According to the letter writer, she is "resolved there to use her skill for something more than empty fame." Unfortunately, Carlile does not seem to have been entirely successful in earning enough to support her family, but she did earn some measure of recognition for herself as an artist. In his 1658 work on contemporary artists, Graphice, Or the Most Excellent Art of Painting, Sir William Sanderson wrote briefly about Carlile. In a list of English "modern masters" whom he judged to be "not less worthy of fame" than any "foreign" painters, Sanderson included "that worthy artist, Mrs. Carlile," noting her excellence in "oil colors." 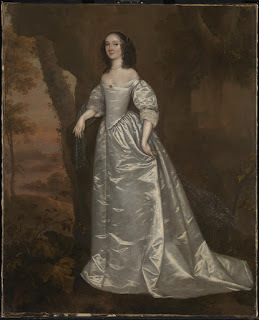 In her will, Carlile refers to other works, now lost (or unrecognized as hers): "the princess in white satin" (which may be a version of the Portrait of an Unknown Lady--the unknown woman in the painting is wearing a dress of what looks like white satin) and "the little St. Katherine and the Mercury." So there may be more works emerging at some point. We can dream . . . The most accessible information for Carlile comes from the Historical Dictionary of British Women; you can access the entry by clicking here. Update, 8 January 2019): I am very grateful to Jane Eade, Curator of the National Trust, London, for making available a copy of her "Rediscovering the 'worthy artiste Mrs. Carlile,'" The National Trust Historic Houses & Collections Annual 2018, ed. Christopher Rowell (2018): 19-24. Her information about Carlile's efforts to earn a living through her art are most welcome--as is her careful comparison of several portraits of sitters wearing that same white satin dress!